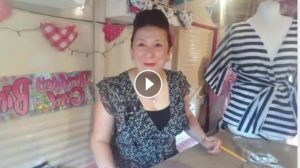 To celebrate the Pink Sewing Bus turning 1, we had a celebration on Facebook doing a LIVE design and sewing session on board the Pink Sewing Bus making this kimono style wrap! Go back to the top of page of your page and use measurement 0.5 along line *1 from this 0.5 point draw a diagonal upwards above line *1. Go back to point *0.5 and draw another diagonal line to just hit the edge of the page 4cm above line *9. Cut out and lay your fabric on the fold! Next post: Creative Careers, Inspiring Kids & a new record for the Pink Sewing Bus!